Blogging, it’s more than a link to me…I have had this post typed up in my drafts for some time now. I come back to it every time I log on to my computer and write a little more here and there so bare with me as you read! I want to share my heart on this blog and touch the hearts of the readers. I want that mom who had the 2 year old in the floor of Target melting down to come here and feel better about her child. I want the woman who hasn’t found a top that looks flattering on her since the birth of her baby to come here and see a new take on mom fashion. I want a woman who works full time or a woman who stays home with her kids to come here and feel loved & appreciated for who she is! I want this to be open look at how I’ve gotten where I am, why I came here and just what all I put into this blog! If you’ve been around for awhile then you know my blog has definitely evolved over the years. In September I will have had my “blog” for 6 years. It didn’t start out like this and to be honest I never even knew blogs existed for a job because I just wrote about what was going on in my pregnancy and never thought more of it. What I didn’t know is that God would unfold this space into something so much greater than I could have ever imagined it. I mean SO much greater even though in the blog world I’m still a spec and that okay with me! It has become a way for me to help support my family, reach thousands, create relationships, help with our bills, provide experiences my family might not have gotten the chance to do without this little space and I am so thankful! And over the years it has evolved into a true life style blog where I get to share my marriage, all of my littles babes as they grow, my true opinions, cute outfits, raw motherhood and things I truly think all of you would love! It has become my heart & passion to share with all of you who come to this space whatever I am going through in life. The good, the messy, the not so perfect! I loved sharing my experiences, my struggles, my stories through each of my pregnancies and the early days of being a new mom but as those days are fleeting so were the days of my niche specific blog. I had to adapt to my every changing life and I have tried my hardest to make this blog an ever changing depiction of my life. Now growing this blog didn’t come easy, nor is it easy now but I honestly can say I have worked my tail off to have a blog that I am super proud of! I spend many many hours behind a computer searching for things, spilling my heart to you guys about motherhood & life, linking things, answering emails, engaging with you all while trying to be the best mom & wife I can be. Let me tell you, I have had some heartache with this space. There have been many tears, many days of “is all of this worth it”, many days of trying to explain to people who simply don’t understand what it means to be successful in this space. I say that lightly because well, there are so many levels of success and so much room for it which is why I try to help anyone who truly has a heart for starting a blog! 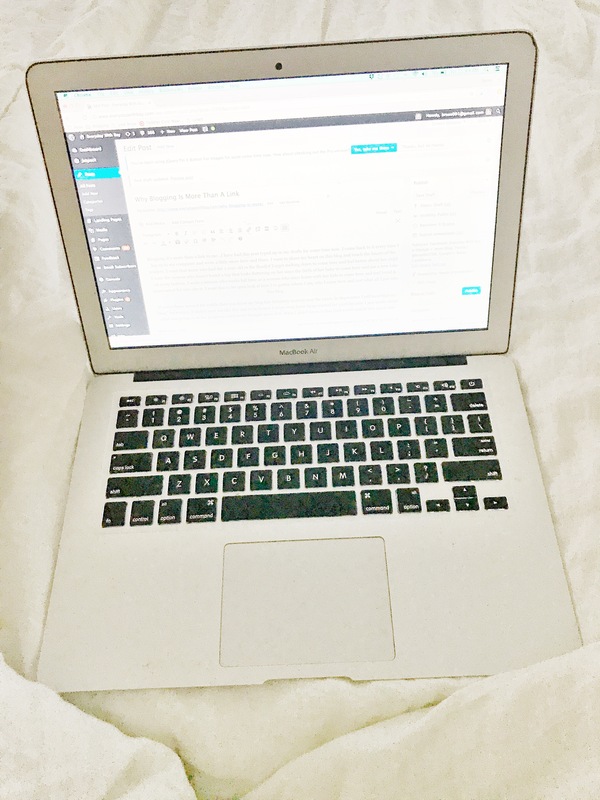 I think this blogging world gets sometimes lost in the mix of “not being a real job” and I can just simply be the first to say it’s sooooo much work, especially trying to do it for an income with 3 kids at home! Just ask my husband, he sat with me one night as I wrote a sponsored post for a brand, edited my pictures (per their list or do’s & dont’s) linked everything, made it SEO searchable, created a Pinterest image…the list goes on & on and he couldn’t believe the work that went in to one post! It opened his eyes so much to what I actually do behind the scenes and I wish all of you could see it. I’m totally not saying that many of you doubt the time it takes to do all of this stuff but before I took my blog to this level I had NO clue so I know there are still lots of you that don’t understand the BTS either! I have had company after company reaching out for collaboration requests but are a small business ran by a one woman show that want me to advertise for them without any compensation…and I have finally gotten strong enough to turn those down. I now realize how much blood, sweat and tears I put in to my job also “ran by a one woman show” that I now respectfully decline anyone wanting to work together without compensation. Can you imagine going to your job and someone telling you “work a full day, produce your best work, provide reports per our request” all for a “Thanks, nice working with ya!” No, no one can and for some reason bloggers are passed up time ad time again because we aren’t willing to work for free?? I’m telling you guys, this is no joke! However, even when asked to work for free all the time one of the biggest rewards of this blog is not any commissions I make off directing sales to sites or writing sponsored content for brands but it’s the messages and feedback that I get from so many of you saying how I have impacted your life in even the smallest of ways. That is what drives me to keep on keeping on when I’m in the trenches wondering why I didn’t get as many page views this month or why that last picture on instagram didn’t get as many likes….yes I know what you’re thinking “that is so trivial” right??! Well yes, it may seem that way to some but when my job depends on my reach, engagments, comments, likes etc it’s not so trivial it’s essential! When it’s your passion to reach people, to make a better life for your family, and to make impacts big or small, it’s far from trivial! So, back to my title, it’s more than a link to me. I’m sure you’ve seen every blogger known to man say “here’s the link” and while yes of course I want you to use my link because the small commission I make off of the purchases sure do make me feel better when I think about all the time & effort I put in to my job! (PS. To squash any myths, any money I make off of purchases doesn’t change the price for you at all, I work with a company who gets paid by the retailer and then that company pays me) I stay up way late after all my kids and husband are fast asleep to make sure I am putting out content for you guys, finding you great deals and doing something I truly have loved from the first post I published, which pleaseeeee do yourself a favor and don’t go back and read it! #awful! I actually do go back to it sometimes just to remember why I started all of this, to be thankful for what this space has grown in to and to thank God for allowing me to do something I love in the presence of my babies as I know these years are short, all while providing an income! Please, if you ever have any questions about what I do, how I make money, etc just ask me! I will most definitely help any of you understand a concept that I had no clue even existed before I started my little CastleBaby blog…any of you been reading that long to remember my first blog name?! I want you to think of me and the way I run this blog to be very relatable and authentic, because that’s what I strive to be! So all in all, I love this blog for me. I love the people it’s allowed me to meet, even online. I love that it reaches people through motherhood, fashion, travel, products and whatever else life may throw my way. I love being a voice for people when maybe they can’t find the words to express how they feel. I hope it is a refreshing space that you grow to love & visit often. Thank you for reading, sharing, commenting, liking, purchasing, telling your friends about my blog…all of it because I truly couldn’t do it without all of you! I thank you from the bottom of my heart & soul for being “link clickers” on things that I truly pour my heart into! It’s your support, shares, and feedback that help financially support this dream of mine because this blog means so much more to me than just a link…and I hope out of everything my love for all of you shines far brighter than anything else! PS. if you made it this far, I seriously love you! I went to ramble town on you guys! You are such an amazing woman and mother. I love your blog and you are my go to for anything fashion related!! I appreciate all that you do!